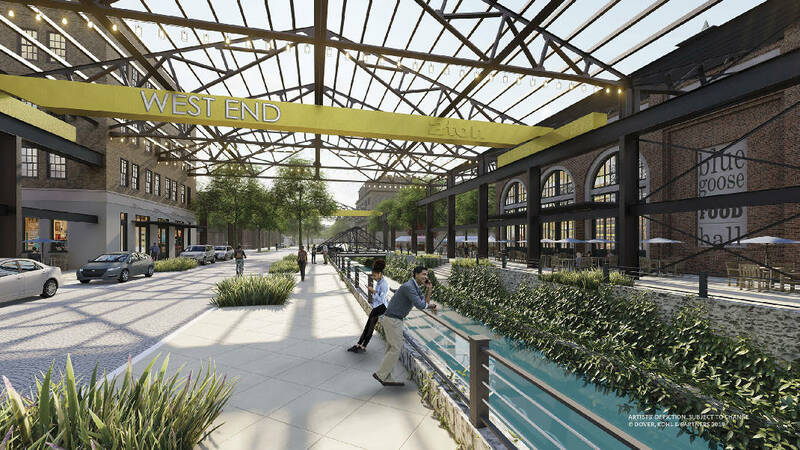 A 10,000-square-foot food hall and music venue, townhomes for millennials and retirees, workforce housing, a canal, brewpub, child care center and more were all unveiled as possibilities in the initial site plan for the former 112-acre Alstom site west of downtown. The public presentation of the plans for what is being coined as "Chattanooga's Next Great Neighborhood" drew about 150 people out Thursday night at the Blue High Bay buildings at 1201 Riverfront Parkway, which are buildings on the site that will be preserved for industrial use, according to the designs. The plan was presented in front of an $88 million vacuum-sealed chamber for testing turbines that Alstom constructed in its $500 million project it later abandoned in anticipation of a renaissance in the nuclear industry that never arrived. Chattanooga real estate developer Jimmy White and local hotelier Hiren Desai bought the Alstom manufacturing parcel from GE Power for $30 million in 2018 and hired south Florida-based Dover, Kohl & Partners to draw up plans for what they say will be the city's "West End." Victor Dover was the urban planner who originally laid out the plans for what eventually became the Southside and who made the presentation to the public Thursday. "We chose to have a public presentation this early on because we want public input," White told the Times Free Press in an editorial board meeting before the presentation. "This is for all of Chattanooga." The proposed new West End development could bring $2 billion to $3 billion in investments to the site, adding over $11 million in tax revenue annually for the city and county and adding more than 5,000 jobs. The project should take about 20-25 years to complete, planners said, and once finished, it will be like a whole other downtown. "Our goal is to bring the city to the river but also to bring the river back to the city," White said. "This is a desolate wasteland of asphalt right now, and we want people to be able to experience the Scenic City." In the first 10 years, the investors envision about 152,000 square feet of office, 438 residential units and 92,729 square feet of retail and dining space. Stretching from 19th Street to M.L. King Boulevard, the 112-acre site would essentially be divided by Main Street, with the land south of Main being reserved for manufacturing/industrial use. Everything north of Main Street would be mixed use with residential, commercial and entertainment buildings. In the 10 years after that, development could include more apartment living, hotels, a company's new corporate headquarters and more. Dover wanted to stress to the crowd Thursday that the plans being presented were a draft — "subject to change." He said they envision a neighborhood that is walkable, car-optional and adaptable to changing needs and technology. Sitting along the Tennessee River and riverwalk, the initial plans keep a majority of the land along the riverbank as a park. Workforce and affordable housing will also be a part of the development. According to Dover, it would represent mixed incomes just like the rest of downtown. Dover said developers have been talking with government and nonprofit agencies in the city, including Chattanooga Housing Authority. "If everything is just gold-plated and expensive, then we will have failed," Dover told the Times Free Press. Only a few questions were asked by people after the presentation, but most of them centered around housing needs in the city. Those who commented wondered if Chattanooga needed more apartments downtown. Dover said that in the first five years, the development would focus on adding single-family attached homes, which he said seems to be an unmet need downtown. After five years, once the market has a chance to absorb some of the other apartments downtown, the new West End would add more apartment units. River City President Kim White said that for-sale, single-family home product is what is missing in downtown. River City is an agency dedicated to the development of downtown. "We've been involved as a partner, and we are happy about the fact that they are very thoughtful in their planning process and they have the data to back it up," she said. "The fact is that we do have a lot of people who want to buy and be a part of a neighborhood, and we don't have that in downtown Chattanooga." Jimmy White said he believes Chattanooga has the population to support the development. If necessary, he said civic buildings on the property could be converted into school buildings to handle an influx of families and children. At least seven potential spots for parking structures are also in the initial plans. The site is within the designated "Opportunity Zone," which is a program that targets specific underdeveloped census tracts and gives capital tax gain breaks to developers who invest in them. In Tennessee, the zone boundaries were set by county mayors and approved by Gov. Bill Haslam in 2018. White said he's still not sure how the Opportunity Zone will impact the development and funding yet, but he said some of the companies that are looking at relocating to the site do know of the tax advantages to them. The plan proposes several measures to conserve and preserve the land's features, including the addition of more than 1,500 trees on the land initially. Some of the architectural designs of the old manufacturing buildings will be highlighted by keeping some of the steel frames from the old factories and creating streets and parks under them. The plan includes several public spaces and recommends "innovative" stormwater devices that can double as both landscaping and water features, including a canal through the center of the mixed-use development. West End officials said new jobs and businesses for the site will be announced in the coming weeks. White said they have already leased out office space in existing buildings on the property but declined to identify the companies. Plans should be finalized by later this year, but work has already started on this site with the demolition of certain buildings. For more "Envision West End" information, visit urbanstoryventures.com.